Kejriwal-Modi meeting in 2010: "Reason" behind secularists' lukewarm response towards AAP in Gujarat? Does Aam Aadmi Party (AAP) leader Arvind Kejriwal have soft-corner for BJP’s prime ministerial candidate and Gujarat chief minister Narendra Modi? Though AAP’s unit in Gujarat vehemently denies this, the question is being widely debated among political circles and senior Gujarat activists, who have known Kejriwal ever since he was more of a right to information (RTI) activist about five years ago. The confusion is particularly worst confounded because they are privy to a little-known fact about Kejriwal – he had a two-and-a-half-hour long meeting, which, they recall, took place with Modi in 2010. 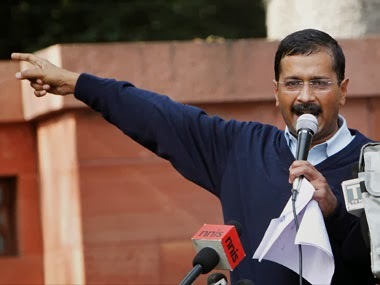 Following the meeting, Kejriwal told his “contacts” in Gujarat that Modi had offered his “all-out support” to Anna’s anti-corruption movement. “Thereafter, some BJP supporters joined the movement, which could not have happened without Modi’s nod. Kejriwal seemed quite impressed with Modi then and he felt that allegations against corruption of Congress leaders in Delhi could not be strong enough without Modi’s support”, the sources pointed out. The only time Kejriwal criticized Modi, suggest these AAP insiders, was ahead of the December 2012 assembly elections, when he called a press conference to say that if UPA government in Delhi was “Ambanis’ dukaan” (shop), the Modi government in Gujarat was “Adanis’ dukaan”. He cited various instances of corporate tieup of Modi with Adanis to show how this was so. “Thereafter, he has not spoken once”, says Sanjiv Bhatt, the IPS officer who was suspended from the service for taking up cudgels against Modi. Bhatt’s refusal to join AAP and criticism against Kejriwal on social networks is said to stem from this factor. Meanwhile, secular-minded social activists in Gujarat have regrouped under a new formation called Javab. Formed in January third week under the support of Delhi-based anti-Modi crusader Shabnam Hashmi, a statement issued by Javab, and signed by several dozen activists, talked of the “imminent danger of communalism” in the country in case Modi becomes PM. “The portends are dark already. As we inch closer to the elections, the façade of development talk is forgotten and an unabashed Hindutva agenda begins to unfold. Uttar Pradesh is the best illustration of this”, it said. “The fate of the avowedly communal political force, the Bharatiya Janata Party, is tied to its electoral fortunes in the state of UP. The arrival of Amit Shah last year as the BJP’s UP in charge coincided with the heralding of the old style communal propaganda. These are again – as earlier – matched by their real ability to foment violence, engineer riots, and drive vulnerable minority groups out of their homes and villages. Muzafarnagar burnt. But the entire belt of Western Uttar Pradesh remains on edge, the traditional unity between Jats and Muslims fractured because of cynical political calculations”, the statement reads. “This Platform will be guided by the sensibilities forged in our collective struggles for dignity of dalits, the rights of Adivasis and other marginalised communities (pastoralists, fisherfolk, landless wage labour, informal and casual labourers), gender justice, the battles of the working class, increasingly fissured and invisibilized; mobilizations for a more equitable and sustainable development, environmental movements, as well as the democratic aspirations of peoples everywhere in the country”, it underlined.